The premier hosting company with 10+ years of experience is none other than Inmotion Hosting. Unlike HostGator, I never found any brutal negative reviews about Inmotion Hosting. I can hear a lot of word of mouth appreciation from my colleagues, So I planned to test and include them in this hosting reviews. As usual, I got a hosting account on the Business aka shared hosting package and installed our demo site to test the uptime, response time and other factors. Once you start hosting your websites with them, surely you can feel the experience of 10+ years playing over there. I have lot of things to share about them in this InMotion Hosting review, and I know you're excited a lot. They started their business in 2001, yes ahead of many hosting companies. InMotion Hosting headquartered in Los Angeles, California and I can say they provide simple, fast and affordable web hosting solutions for small or mid-size or large business websites. They have two office West Coast office and East Coast office where all the people including support executives work. You can have a look at their office workspace here. Enough said it's time to discuss the data like uptime, response time and other things in this InMotion Hosting Review. As per my testing parameter, I bought a hosting package and installed a demo site on their servers and started monitoring their services. Domain and Hosting registered on Aug 2016. Sign up process is simple. There are four steps to sign up. Customer UI and Cpanel images below. The Cpanel is similar to most hosting provider and I'm extremely thrilled to get so much tutorials on support centre. Please have a look on the image below, they have almost all tutorials through various modes PDF, videos, How to guides etc. Apart from Shared hosting plan, InMotion Hosting offer managed Cloud VPS and dedicated hosting and reseller hosting for its customers. (l﻿﻿﻿﻿earn m﻿﻿o﻿﻿r﻿﻿﻿﻿﻿﻿e). We keep monitoring demo sites for every 60 seconds to check for downtime. To build more trust to our reviews, you can check historical uptime data for upto two years using this link. While many Hosting companies won't even care about downtimes, InMotion even sends you mail, announce through their social pages regarding this few seconds downtime which keeps me excited and you can see their commitments for the customers. In this InMotion Hosting Review , I will update the uptime month over month for the upcoming months. Based on our testing methodology, I tested the InMotion hosting demo site on byte check and the time to first byte is 176ms which is industry's best time. Time to first byte is great simple due to the presence of SSD drives. Here's an small story about InMotion Hosting SSD drives. I'm not really happy about the results. 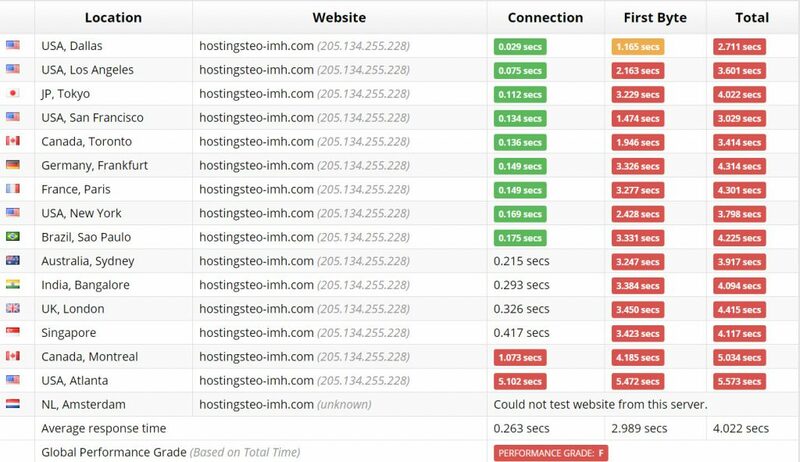 If you check SiteGround or A2Hosting response time, they are way ahead of InMotion Hosting. The response time is same most of the times and not better when compared to competitors. Great insights of #InMotion hosting with historical uptime, response time and TTFB values. Most Hosting Companies I reviewed only offer sales support via chat, but InMotion Hosting offers both technical and sales support via the chat system, so you don't need to open a ticket whenever you want to contact techies over there. They offer unparalleled customer friendly support where you will get in touch with a representative in less than a minute. You can look into the office where InMotion Executives works. While writing this Inmotion Hosting review, I looked for a solution and contacted their support during non-production time and got a reply within seconds. Free daily backups : daily 24 or 36 hours backups even for basic package. Truly industry leading in terms of building a trust to its customers. You can get 90 days money back guarantee with all shared hosting plans. This simply shows how confident they are towards the business model. They are ready to serve you with greatest servers on the planet, are you ready to start your website ? The results comes as mixed feeling. The uptime is good but the response time is not something to get proud of. The review has been wrote around 2016 but since then InMotion Hosting improved a lot with inbuilt caching mechanism, Free SSL and much more.